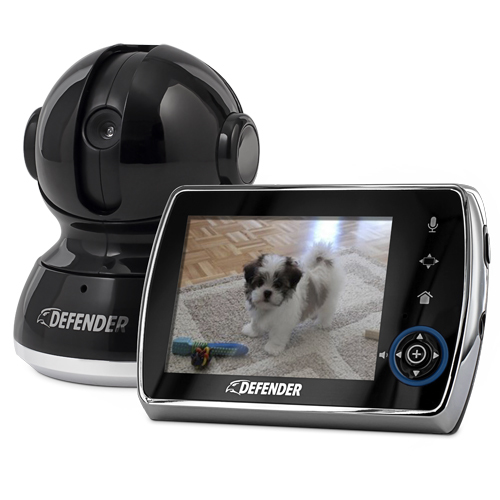 Ensure your eyes and ears aware at all times with the Defender® Phoenix™ 3.5” wireless video monitoring system. With the included SD card, you are able to capture images or videos of an intruder, pet or employee. The built-in recording grants you the flexibility to record images or videos on demand with built-in motion based recording and on demand recording features. The camera’s 8 invisible infrared LEDs show you what is happening up to 15ft away in complete darkness. The rechargeable lithium ion battery will perform up to 24 hours in power save mode so you can enjoy full-time, secure monitoring. ClearVu® technology provides a clear and secure digital signal from up to 750ft away. The two-way intercom can be used to communicate with family members, staff and visitors from anywhere on your property. Mount the sleek camera on a wall or sit on a desk and adjust 240° horizontally and 65° vertically for a perfect view. With extra features such as an LED volume indicator, adjustable brightness, and expandability up to 4 cameras, you can be sure your property is in good hands. The camera’s 8 invisible infrared LEDs show you what is happening up to 15ft away in complete darkness. “Invisible” LED night vision lights do not cast that distracting red glow. You can monitor your room discretely in the dark without drawing attention to your camera. Battery life of 72 hours based on 10 audio activations while in power save mode. Battery lasts an average of 6 hours with continuous audio/video usage. This product is intended for indoor applications only.